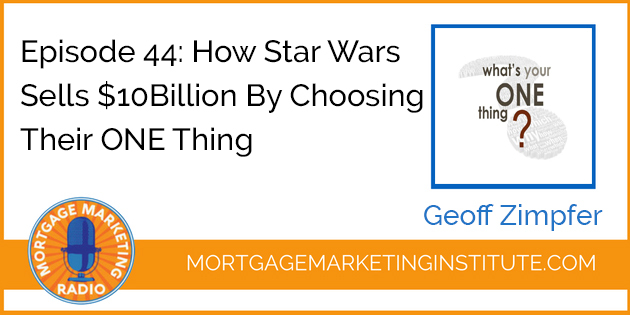 On this episode we continue our discussion from the book The ONE Thing. A common response from Loan Officers when sharing the principles from the book is that it’s impossible to not be interrupted during an average day in the life of a Loan Officer. Success does not mean perfection. It’s not about avoiding distraction every minute of every day. The perfect, uninterrupted day is impossible. The goal is to figure out what matters most, and when you’re doing that ONE Thing, eliminate distraction. I time block. If you looked at my calendar, you’d see regular appointments with myself to do my most important work. That’s when I avoid distractions at all costs. Think of it like going to movies. You’re there for ONE Thing—to see the film. Because you’re really clear about that, you turn off your cell phone, you grab snacks in case you get hungry, and you probably even make a pit stop before you go in. All this so you can have an uninterrupted experience. What’s Star Wars ONE Thing? Making awesome movies right? Did you know Star Wars sells $10Billion in movie related toys and apparel but has only grossed about $4Billion from its movies? So making movies is Star Wars ONE Thing. Focusing on that creates an audience of loyal fans and a distribution channel that’s worth billions. When you time block your most important work and treat it like going to movies—you build a bunker around avoiding distraction and amazing things happen. When you start thinking of your days this way, the burden of always having to be “on” diminishes and you end up accomplishing more. How do you discover what your “one thing” is? Of course its not just ONE Thing forever but one step at a time. In other words, absolute focus on that ONE, most important thing at that time that will move your closer to your outcome – one step at a time. Success is sequential, not simultaneous. Its one step at a time; ONE thing at a time; It’s not your one and only thing. It’s the ONE Thing right now. Your ONE Thing is always tied to your destination. At any given moment it is your most levered action – your first domino – that starts it all and gets you the most bang for your buck. We can’t do everything, but we can do ONE Thing that matters most at any given moment in time. Over time, a pattern can emerge around your career, skills and passion. For me, my ONE Thing always comes back to teaching, coaching and sharing content in one form or another. That’s my ONE Thing. Listen to today’s episode. I hope it helps you get clarity and focus on your ONE thing – for right now.